If you dont want them online, you just have the wait for them to show up at your local store accidentally. So try and learn when the crabs come in, and check quickly after a shipment came through. I've never seen them shipped to any store "accidentally". They usually have to be special ordered. Straws are considered exotics, and do need special care. Please be able to give that, and have experience under you belt before acquiring them. 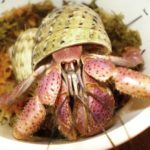 Not going to lye I get so up set when I see people buying crabs form online or at a pet shops.Because even if you know what hermit crabs need and know how to take care of them ALL hermit crabs come from the wild which is both bad for the crab and the wild. When you buy them online or at a pet shop you are giving them money to keep abusing hermit crabs,because the hermit crab costs them nothing and then you give them money and you think well I am saving this hermit crab well you are not really you just gave them money to continue what they are doing and then another cab takes that crab's place, so you really did nothing but give them money to continue to abuse hermit crabs. I purchased strawberries from an online type store back in July. I sent several emails back and forth asking questions like, are they in stock, how long they had this shipment, can I arrange pickup to avoid shipping. After about a week of emails and feeling satisfied with their responses I purchased them. Once I placed my order we arranged a time and meeting location at hospital. I drove approximately 500 miles round trip, about an hour north of Harrisburg, PA to Fredericksburg, VA. I left my house at 7am, made a pitstop at a huge petshop on the way for a few items and reached the pick up area by 12:30-1 pm. I was way early and killed 4-5 hours at Kings Dominion. When it got close to our meeting time I met up with the store and got the crabs. As I got them situated in my travel tank it started to down pour and continued for most of the way home. I think I made it home around midnight. So far in the 3 months I have had them I lost one out of the 6 I. I believe he suffered from Post Purchase Syndrome (PPS). From the second I placed them in the travel tank I had one guy that was not as active compared to the others. He held on for maybe 3 weeks. Everyone else has molted and most have swapped shells and all seem to be doing well. As GotButterflies stated they do have "special needs" compared to other crabs. She has been a big help to me with my questions and concerns I've had about their care. She also created a custom food order for them from her Esty store, The Heathy Hermit. Their special needs haven't been too difficult so far. I still hope I am doing everything correctly. They love salttwater with bubblers. After I haven't seen my swim I was told told to try adding bubblers. Once I did that they are always go swimming. They also require foods with lots of carotine for them to keep their bright red color. They also require a steady constant temperature. This is what drives me insane because even with 2 heaters my tank will carry between 3-4 degrees between night and day. Please keep in mind also that the average lifespan of a Strawberry is only 2 to 4 years in captivity. A few crabbers have managed to have crabs that lived longer but they did nothing different so it may just have been the individual crabs. GotButterflies wrote: I've never seen them shipped to any store "accidentally". They usually have to be special ordered. Straws are considered exotics, and do need special care. Please be able to give that, and have experience under you belt before acquiring them. Its been very rare, but over the years have heard it happening. Probably not recently... but in the past, yes.